Nikita Parris scored twice and Melissa Lawley found the net on her first start as England cruised past Kazakhstan with a 5-0 win to maintain their perfect record in World Cup qualifying, reports TheFA.com. Four goals in 13 second-half minutes saw the Lionesses seal a comfortable victory with substitutes Fran Kirby and Isobel Christiansen also on the scoresheet. The Lionesses now have three wins from three in Group 1 and are just a point behind leaders Wales who have played a game more. Kazakhstan remain without a point after their four qualifying fixtures. Interim head coach Mo Marley made seven changes from the 4-0 win over Bosnia with Lawley breaking the deadlock before Kirby doubled the lead from the penalty spot. Parris then scored twice in quick succession at the Weston Homes Community Stadium in Colchester before Christiansen rounded off the scoring. 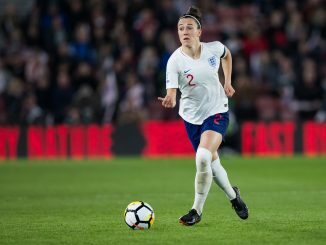 The Lionesses had an early shout for a penalty when Parris was brought down by Aida Gaistenova after Jodie Taylor’s clever lob but referee Lois Otte waved away the appeals. 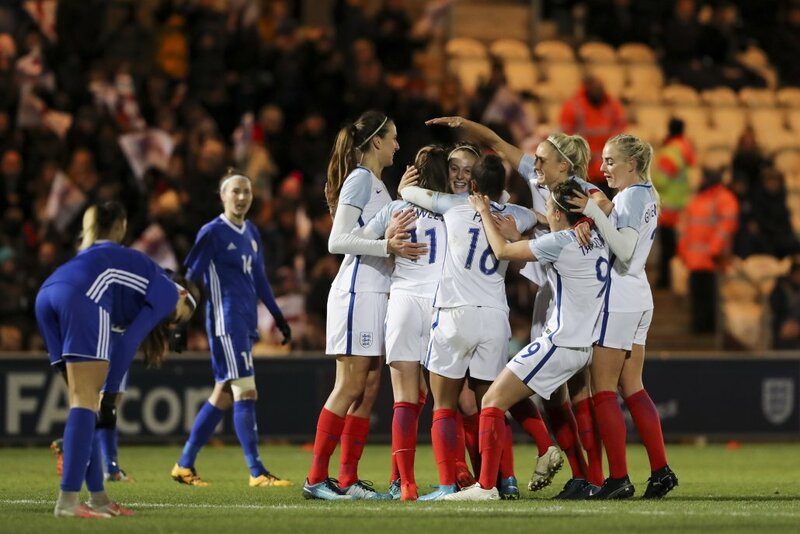 England didn’t have to wait long to break the deadlock, though, as Lawley scored her first England goal with a calm piece of control and neat finish after debutant Keira Walsh’s cross. On 21 minutes, Fara Williams picked out Parris with a cross-field ball and the Manchester City striker fed Taylor, who found the back of the net, only for the offside flag to be raised. 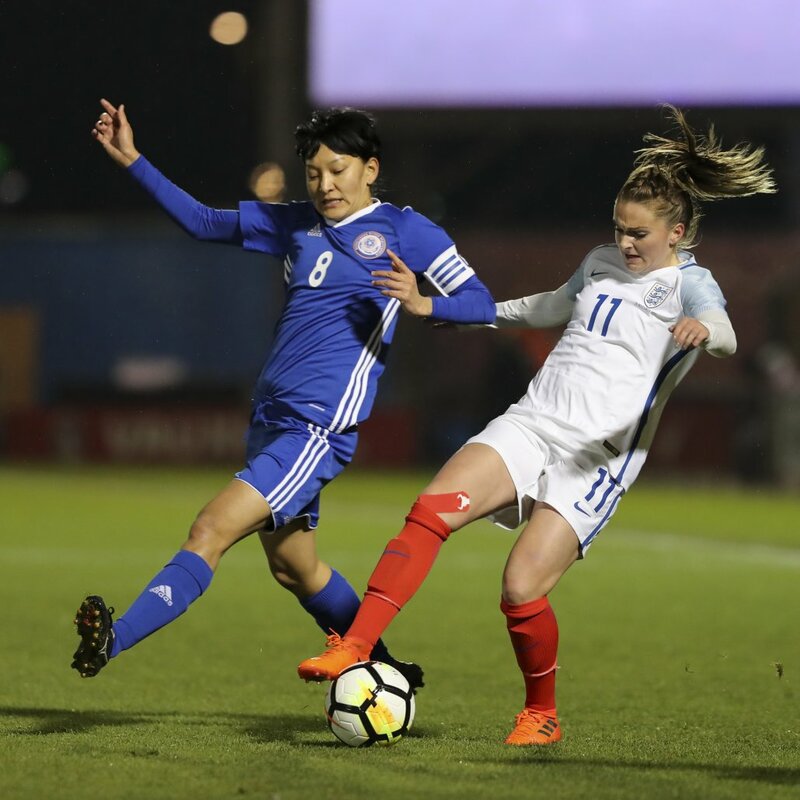 Liverpool’s Alex Greenwood came closest to grabbing England’s second when she struck a wicked volley only to see goalkeeper Oksana Zheleznyak tip the ball over the bar. 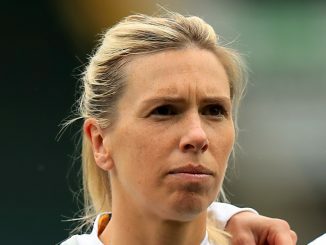 Jill Scott was next to test Zheleznyak after a clever lay-off from Taylor but the Kazakhstan goalkeeper was able to parry the ball away from danger. Williams then tried her luck from long-range after 38 minutes to further test Zheleznyak, Taylor was first to the rebound and poked beyond the keeper but was ruled offside. Despite dominating, England led by a single goal at the break and Taylor went close again after the restart as she sent the ball over from close range after a searching ball from Greenwood. Parris was then picked out well by Williams to force an excellent save from substitute goalkeeper Irina Sandalova. Defender Bibigul Nurusheva then put the ball against her own post as England again pressed forward and continued to dominate possession and territory. But after Kirby and Christiansen were brought on by Marley the goals soon began to flow with the Chelsea striker scoring from the penalty spot with her first touch after a handball. Parris then had her first goal of the evening as Kirby found her with a brilliantly timed pass and the Manchester City striker blasted the ball past Sandalova. The 23-year-old was in again just seven minutes later as another well-placed through ball from Greenwood was left by Kirby and Scott and Parris collected to calmly slot past the goalkeeper. And the result was wrapped up on 76 minutes as Kirby headed Greenwood’s cross down to Christiansen inside the six-yard box who tapped the ball home from close range. 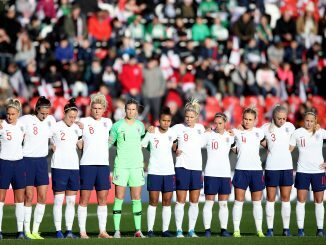 England (4-3-3): 1 Karen Bardsley (Manchester City); 2 Lucy Bronze (Lyon), 5 Steph Houghton (capt; Manchester City), 6 Gemma Bonner (Liverpool) 3 Alex Greenwood (Liverpool); 10 Keira Walsh (Manchester City), 4 Fara Williams (Reading), 8 Jill Scott (Manchester City), 16 Nikita Parris (Manchester City), 9 Jodie Taylor (Arsenal), 11 Melissa Lawley (Manchester City). Substitutes: 14 Fran Kirby (Chelsea) for Taylor 62, 15 Isobel Christiansen (Manchester City) for Williams 62, 17 Jess Carter (Birmingham City) for Bronze 76. Substitutes not used: 13 Carly Telford (Chelsea), 12 Jo Potter (Reading), 18 Leah Williamson (Arsenal), 19 Jordan Nobbs (Arsenal).